So I finally got around to watching Caprica, the spin-off pilot from the mostly-wonderful Battlestar Galactica. As a scientist, I'm usually pretty happy to just let the science-fiction bits of such programs wash over me: to just suspend disbelief and treat them as fantasy. With Battlestar this was particularly easy to do, as so little of the science was really explained. But with Caprica, the way they said you could create a virtual human personality was so plausible, well-explained, and—in my view—so completely wrong, that I thought it worth putting something on the record. So the idea is this. If you take all the data about us that potentially exists—from photos to medical records, to Google searches, to school results (supposedly about 300Mb)—you can then infer everything you need to know in order to recreate our personalities. This is an absolutely terrific plot device if you're a TV writer, because it means that you can recreate a person without having their permission or ever having them present. Also, it sounds plausible because, if you've been reading up on deep data mining, you'll know that information from one domain can indeed be used to make inferences in other domains. (Where you bank may imply you're more likely to wear brown shoes). However, I would argue that—if we've learned anything at all about how our brains work over the last 30 years or so—it's that, as machines, we're driven by association, not data. Synapses are strengthened when neurons fire together and wither when they don't. We learn because experience has taught us associate sensory inputs—what we see, hear taste, touch, and feel—with positive or negative outcomes. These may be immediate, or steps along a chain of events. And the association may be with the exact stimulus or something that's just similar. So I might be especially nice to someone who looks a bit like a favorite teacher I once had and not even realize why I instantly liked her. It's associations like this—to people, to food, to situations—that encode personality. Knowing the grades I got in my teacher's class would help you not one bit in predicting how I would respond to the new face. This may sound reminiscent of the debate between 'good old-fashioned AI', which is basically top-down and knowledge based, and behavioral or associative AI. Well, it's not really a debate any more: books like Jeff Hawkins' On Intelligence succinctly explain that animal (including human) intelligence is much more about pattern matching than anything else. Which is not to say that it may not be expedient to use expert-system-type systems within an AI you are building: its just that such systems will not get you very far if you want to build a human-like AI. Oh well. No doubt I'll soon be as addicted to Caprica as I was to Battlestar: apart from my grumbles above, I found it completely compelling. Let's just hope that the amount of tech-speak in it drops off enough that I don't have to turn off my entire left brain to get through it... or embarrass myself by shouting at the TV. I don't know much about this widely-publicized project to build a electronic brain in a brain-sized package as I've just found out about it and I haven't yet managed to get my hands on any real technical information. However, reading the IBM press release I found out something very positive that has been omitted from most of the coverage so far. One of the researchers collaborating with IBM is Kwabena Boahen, head of Stanford's Brains in Silicon Lab, a former student of Caltech's Carver Mead, and a key researcher in the neuromorphic engineering community. Exactly what this means in terms of the approach that the researchers are taking is hard to say, but I'll do my best to find out. I've been interested in on-chip and chip-to-chip communications for many years, partly because optics looked likely to be an important technology in this area, and partly because dense interconnectivity is important for neural systems. However, you may be interested in an advance in interconnects for a different purpose: allowing electronics to stretch and conform. The UIUC team that did the work have used it to build a hemispherical detector, and the technology may well have an important impact on wearable sensors and actuators. One of the impressive things about this work is how quickly it's evolved: in the space of a couple of years they've gone from lines of silicon with a little give, to fully-functional very-stretchable circuits and systems. Not surprisingly, the team have already started up a company to exploit the new technology. I know I'm not the first to write about this work, but the other stories I'd read didn't really explain the technology or the importance to any serious extent. I hope you like the piece. 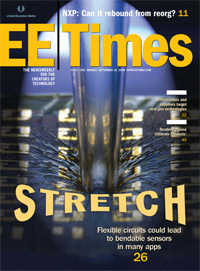 Stretch: EE Times cover on 22 September 2008. 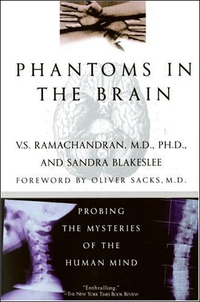 Though this book—which describes how 'freak' conditions like phantom limbs can help us understand the brain—is very interesting, it's flaws are also deep. Finally had time to finish off my review after having it bubble away in the back my brain for several months. Hope you find it useful. If anyone knows of a much better Ramachandran that I should have read, do leave a comment. It won't make the top of my must-read list, but I'll try to have a look at it. I've been taking a break from writing to work on another project this spring and summer but managed to find the time to finish off a story about the iCub. This open-source robot is designed to allow academics to concentrate on implementing their theories about learning and interaction without having to focus on designing and building hardware, and is part of the general trend towards open source in the field. You can find out more by reading the full piece in EE Times. 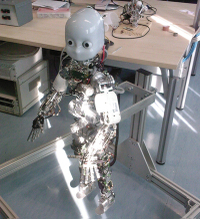 Photo: The iCub is an artificial toddler with senses, 53 degrees of freedom, and a modular software structure designed to allow the work of different research teams to be combined. If you've been following my analog posts you'll know that one of my concerns has been that we don't train enough engineers who are really comfortable working in this area. Analog has two major problems: not only is it just generally more difficult to design (much harder maths! ), but once you do you have to go and have a chip fabricated (i.e. spend time and money) to see how it works in practice. Digital designers have an easier job to begin with, better tools, and can reliably simulate using systems like field-programmable gate arrays (FPGAs) if they'd rather not work in software simulation alone. Plus there are a gazillion of them, which also helps them to make progress! If you're interested in building brains into machines, this matters because analog technology seems to be the most appropriate (in terms of both power and behavior) in which to implement artifical neurons that behave in biologically-plausible or -inspired ways. This is basis of neuromorphic engineering. Although not a new idea, field programmable analog arrays (FPAAs) may be one way of making possible both the rapid prototyping of chips and rapid training of students. Paul Hasler and his colleagues at Georgia Tech have been working on both improving the FPAA technology itself and the interfaces that designers can use with them. If you're interested in this, please check out my recent article in EE Times on the subject. Picture: Paul Hasler and PhD student Csaba Petre demonstrate the interface to their FPAA chip. Photo by Gary Meek. I was on the phone today with Mary Lou Jepsen, founding Chief Technology Officer of One Laptop Per Child and now founder of Pixel Qi, a commercial spin-off company of OLPC that will be putting their new ambient-light-viewable displays into cell phones and laptops. Mary Lou and I both started off in holography about twenty years ago, and have (miles permitting) been friends for most of that time. And she has never ceased to amaze me: both in her talent and in her fortitude. I haven't been following the OLPC story that closely, partly because—as a freelance—I know that it's too big a story: it's of interest to consumer journalists, tech writers, even those writing the political pages. In that kind of environment it's hard to sell freelance pieces. But talking to her today made me realize that there was a story about engineering that was worth my telling... a story about how to not just think about building a system from the ground up, but to re-think it. A story about how to innovate. 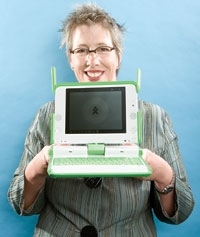 Mary Lou said that, working at OLPC, there was no single innovation that she was most proud of: it was leading the work to put the whole thing together into a practical, packaged, working system that she felt was her biggest contribution. The new machine, the XO, is the cheapest, greenest, lowest-power computer in the world. This couldn't have happened by trying to produce a stripped-down version of an expensive laptop. The whole approach had to be completely different. That's easy to say, but I didn't really understand how deep this philosophy went until she gave me an example: she started explaining how she planned to get 5-10 times the power efficiency (and so battery life) from the new Pixel Qi laptops as from the ones we carry around today. The answer (which AMD gets and Intel doesn't!) is to turn off the central processing unit (CPU) when you don't need it. The truth is that most of us, most of the time, have vastly more processing power than we need: like when web browsing or typing an e-mail. This is obvious. People know this. But no-one thought to question the unwritten assumption in computer design that the processor needs to be on whether it's busy or not. By finding ways to bypass the CPU when idle—by building a machine in such a way that the input/output devices can operate without it—Mary Lou and her colleages will be able to supply us with the interface we need without having to have a supercomputer running in the background for no reason. That's an innovation. And it doesn't take too many such innovations to create something that's really new. I can't wait to see what she does next. Photo: Mary Lou Jepsen with the XO. One of the many things that have kept me from my blog in the last month or two has been working on a new progression of a newsletter I edit called The Neuromorphic Engineer. The new format is is more accessible, searchable, and generally usable, plus it allows for different kinds of content including blog posts. I've put a few of my own posts up as well as all the old newsletter archives, and there will be new content every 2-4 weeks. If you're interested in how people are trying to build technology that emulates the neural systems of various animals (particularly, but not exclusively, using analog technology) then check this out. 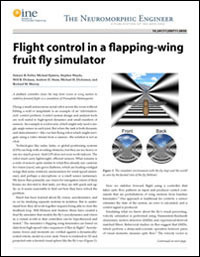 In general the articles are more technical than my blog, but less technical than journal papers. I'd really like to hear what you think and any suggestions you may have. I've always been addicted to radio, but I haven't usually been that impressed by science programming. In my experience it tends to be too news, business, and application based, with not enough about the ideas. 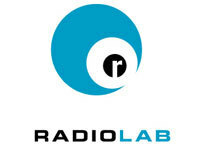 However, I've become addicted to Radio Lab since I heard it plugged on my other favorite US radio show, This American Life. Decided it was worth mentioning here because I started to realize how many of the shows have been somehow related to the brain and perception. Listening to Christof Koch talk about how the claustrum may help synchronize neural activity (in the episode on Emergence) in particular made me want to share. The show's a little odd. In many ways it feels like it's more aimed at teenagers than adults. But the ideas it discusses are often sophisticated and thought provoking, and even with subjects I'm familiar with, I've usually come out learning something new. Great for those of us who have a long commute!